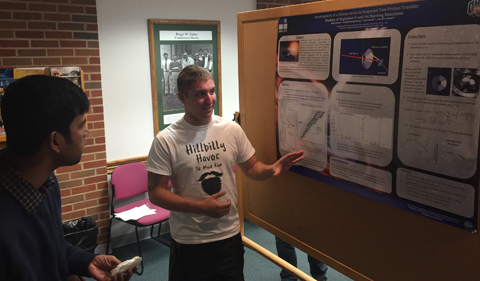 Ohio University’s Institute of Nuclear and Particle Physics hosted an Open House recently at the John C. Edwards Accelerator Lab. 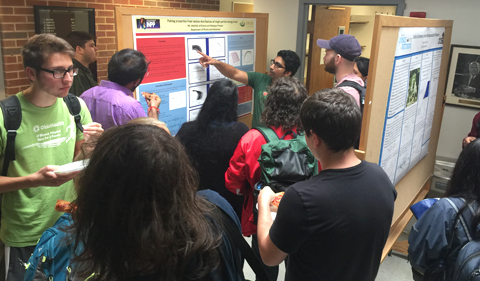 Doctoral students working with faculty members associated with INPP and the Physics & Astronomy Department shared their research and findings in an afternoon poster session. Visitors and participants were invited to enjoy refreshments and tour the accelerator facility. INPP staff and faculty members were on hand to answer questions. 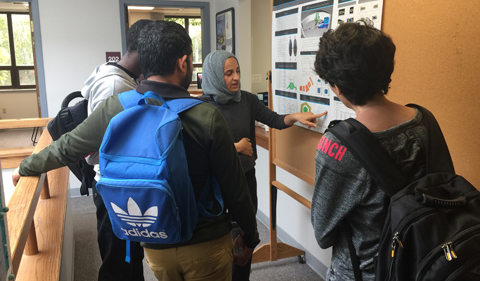 INPP promotes and supports research in theoretical and experimental subatomic physics, educates graduate and undergraduate students in these fields of study, sponsors joint seminars, hosts visiting scientists, and provides matching funds for new initiatives undertaken with federal agencies and national laboratories. The institute facilitates the work of INPP members who investigate the dynamics of the matter that makes up the atomic nucleus and who examine manifestations of this dynamics in systems ranging in size from a single proton to a neutron star. They combine data from laboratory experiments, astronomical observations, and theoretical studies in order to examine the role of the fundamental forces of nature within these systems and apply the techniques and insights of nuclear physics to important problems facing society. My project is about how nucleons inside a nucleus form “pairs” and how to study this for all possible nuclei simultaneously. This is important because the result for pairing phenomena encompasses all possible nuclei and puts universal bounds on them. I want to understand the origin of the “elements” in the universe and the nuclear reactions taking place in an astrophysical setting. Thousands of experiments and theory calculation need to be performed. My calculation provides a guide towards such calculations. My project is about the designing of a detector for astrophysics research. It is important to do this type of research to help provide answers to the question of “Where did all of the elements come from?” It is very exciting to produce and measure particles that are currently undergoing nuclear reactions in the universe. 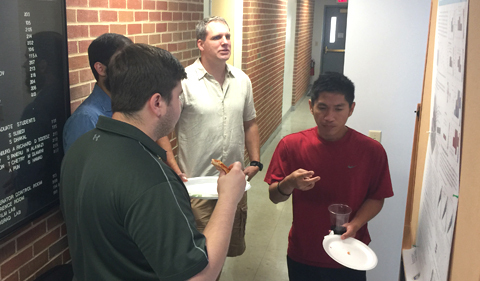 Doctoral student Matthew Burrows (right) presented “A numerically Stable Approach to Removing the Spurious Center of Mass Motion in No-Core Shell Model local Densities”. My research is about reducing error associated with computation in common nuclei modeling. In order to compare theory to experiment, researchers need to reduce error and know all sources of error. It is quite exciting to find improvements on such a widely used method. I greatly enjoy the computational aspects and challenges of this work. 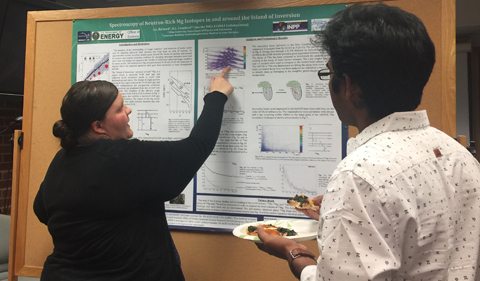 Doctoral student Taya Chetry (center) presents, “Study of Coherent ω–Meson Photoproduction off Deuteron”. The project involves a reaction where a photon beam is bombarded onto deuterium target and final state particles π⁺, π⁻ and d are detected to extract information about ω-meson. Every particle (a nucleon or a meson) consists of quarks that interact with each other via the “strong force.” To understand quarks, mesons can be studied. Also, this particular study seeks to deduct information about vector meson-nucleon interaction which cannot be directly studied (as no vector meson beam is practically possible). The idea that one can study the fundamental particles of the universe and transform the understanding to a bigger scale (such as nucleons, atoms or molecules) is itself very exciting. 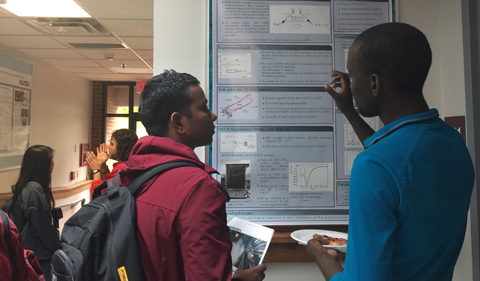 Doctoral Student Mongi Dlamini (R) presented “Deeply Virtual Compton Scattering at Jefferson Lab Hall A”. My project is about analyzing electron-proton collision data in a framework that will allow us to study what is happening inside protons, and ultimately understand how such systems (protons and neutrons) are built and evolve as governed by their most fundamental constituents. The electron-proton scattering data has been generated and collected at the Thomas Jefferson National Accelerator Facility in Virginia over the past few years and our job right now is to squeeze all the physics out of that data. As a nuclear scientist, one of the most important questions nuclear physics has to answer (also identified as research frontiers for today’s nuclear science by the 2007 Long Range Plan of the Nuclear Science Advisory Committee) is “what is the internal landscape of a proton or a nucleus?” My research will contribute toward answering that question by giving a 3D tomographic image of the interior of a proton and this will go a long way in improving our understanding of matter. I would say the nucleus is the “heart of matter” and if we are to unlock the so many wonders that nature has left for us to figure out, nuclear physics is the most direct route to doing that. The prospects of being part of a body of scientists aiming to improve our understanding of the building blocks of matter, their origin and their evolution was more than enough to get me in. My project is about using R-Function to study the High Resolution Spectrometer (HRS) acceptance for Deep Virtual Compton Scattering (DVCS) experiment in Hall A at Jefferson Laboratory. It is important to study the acceptance of the HRS in our experiment because there was a major issue with one of the components of the HRS which directly affected the acceptance. We were able to study and control the effect of this issue on the HRS acceptance by using R-Function. I have always wanted to be a part of something important. My work on the HRS acceptance analysis is so exciting to me because Jefferson laboratory is one of the best laboratories and is used by an international user community of more than 1200 physicists for a program of exploration and study of nuclear, hadronic matter, the strong interaction and quantum chromodynamics. 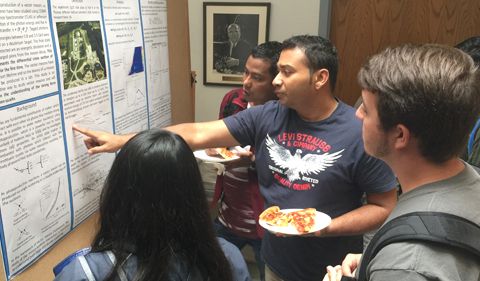 Doctoral student Sudhanva Lalit (center) presented, “Thermal Effects in Dense Matter Beyond Mean Field Theory”. 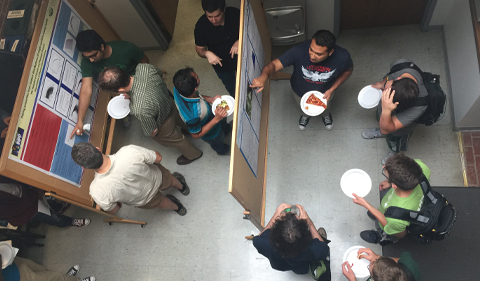 Doctoral student Abinash Pun presents “A Study of EmCal Clustering Algorithms”. My research is about the study of clustering algorithms that can estimate energy of particles produced in a heavy ion collision. It is important to find a clustering clustering algorithm for a sPhenix detector. The energy of the particles produced in the heavy ion collisions is very important to reveal the properties of the Quark-Gluon-Plasma (early state of our universe). Being able to contribute in the grand project about unraveling the mystery of the earlier universe is quite exciting. 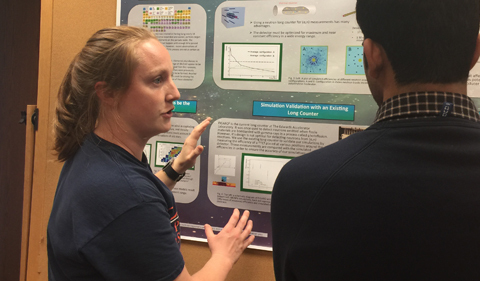 Doctoral Student Andrea Richard presented, “Spectroscopy of Neutron-Rich Mg isotopes in and around the Island of Inversion”. 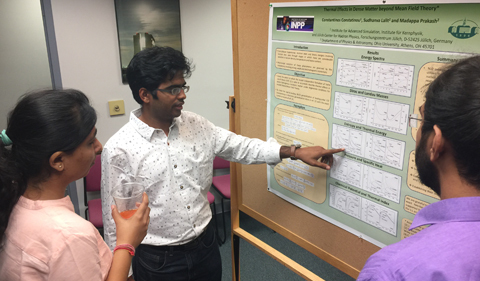 My project primarily focuses on the structure of the exotic magnesium isotopes that have at least 20 neutrons, and are located in the Island of Inversion, which is a region in the nuclear chart where isotopes exhibit unexpected structure. 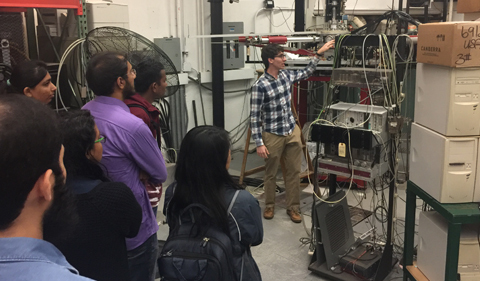 We have completed two experiments at the National Superconducting Cyclotron Laboratory at Michigan State University in order to probe the structure of Mg-33 and the surrounding isotopes. This project contributes to our overall understanding of the nuclear landscape and the overarching questions about how nuclei are made and organized. It also provides new information about the rotational structure of the magnesium isotopes (in the Island of Inversion), which had not been previously observed. When I first decided to work on this project, I wanted to learn more about exotic beam physics and to have the opportunity to do experiments at NSCL and with the Gamma-Ray Energy Tracking In-beam Nuclear Array (GRETINA). Since then, I have come to develop a deep appreciation for the structure of nuclei and all of the things you can learn from different kinds of experiments. 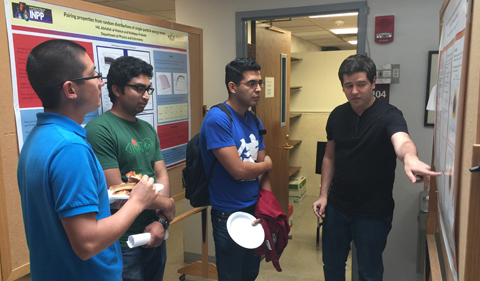 Doctoral student Doug Soltesz (R) presents, “Development of a Silicon Array to Augment Two Proton Transfer Studies of Explosive H and He Burning Reactions”. My research is about how to indirectly measure the reaction rates that occur in X-ray bursts. It is important to study this because we don’t completely know how these stellar explosions work. This research should help to give us a better idea. I have always found stellar explosions to be an interesting topic. 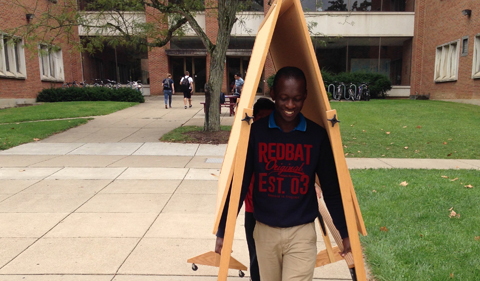 INPP graduate students Mongi Dlamini and Abinash Pun move poster boards from Clippinger Laboratories to the Edwards Accelerator Lab in preparation for the INPP Open House. 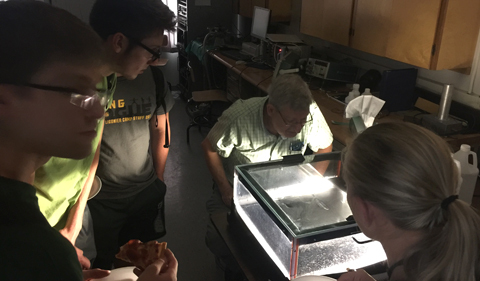 Dr. Thomas Massey demonstrates the tracks of cosmic rays as they pass through a cloud chamber. 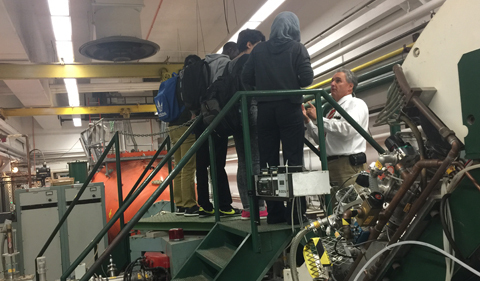 Dr. David Ingram describes the operation of the accelerator. Dr. Zach Meisel points out some of the detectors that are used in the experiments carried out at Edwards. 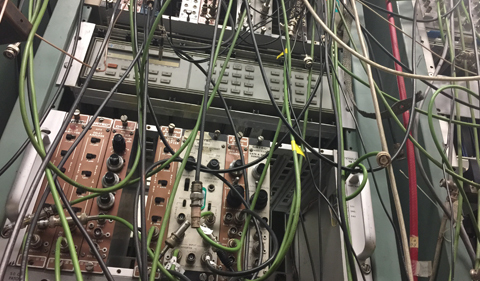 Cabling in the control room allows the signals generated by the subatomic particles produced in collisions to be recorded and analyzed. 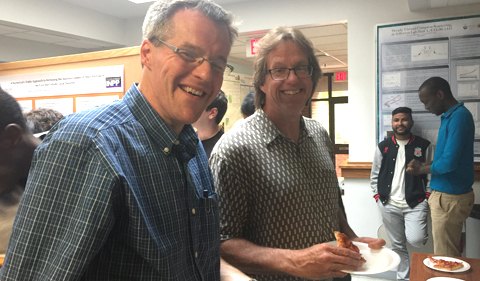 INPP Director Daniel Phillips shares a moment with Edwards Accelerator Laboratory Director Carl Brune.